Spinoffs can take many shapes, often times a company has a hidden gem or assets the market can't readily value inside of their current structure (HHC's assets within GGP comes to mind), other times its management trying to lose a business that is perceived to have a difficult operating environment going forward and is a drag on the core. In some fashion, the value of the parts is greater than the sum. In July 2012, defense contractor L-3 Communications spun off most of their government services business, Engility Holdings (EGL), in what many described to be a "dump transaction". It sure looked that way as L-3 kept the most lucrative areas of government services (cybersecurity, intelligence and security solutions business lines), and saddled the newly formed company with $335 million in debt, $325 million of which was paid to L-3 in order to pay down debt and repurchase shares. With L-3 holders receiving only 1 share of Engility for every 6 shares of L-3, it probably also caused a small amount of forced selling as some L-3 investors might not have wanted to hold the less profitable business lines or be restricted due to market cap minimums. Whatever is the case, it was almost structured to be ignored by the broader market and as a result there's very little press/analyst coverage. Engility provides systems engineering services, training, program management and operational support to the U.S. government. 99% of their revenues are service based (no tangible products) to the U.S. government and its agencies. With decifits and sequester talk in the headlines, the defense industry has been a particularly easy target for politicians wishing to reduce government spending. Engility's response to the current environment has been to slash costs, underbid competitors, and reposition the itself as the "low-cost, technically-acceptable" provider to its customers. Even so, Engility's revenues will decrease with the company's contract work in Afghanistan and Iraq rolling off as the troops come home. On the positive side, some revenue might be recovered now that Engility is a separate public company allowing them to bid on contracts that were otherwise restricted from them due to conflicts of interest with L-3 Communications. With little history to go off of, the best place to gain an idea of what the business might be worth is management's guidance for 2013 (which was reaffirmed on the Q1 call). Using the low end of their earnings guidance, Engility is trading for roughly 7.5x earnings (about half the current market multiple) or about a 6.3x EV/EBITDA ratio. Engility is trading for a slight discount to its peers as well in Booz Allen, CACI, and ManTech, which are in the 8-9x earnings range. Besides the revenue run off, what else is not to like? Oh yeah, the $335 million in debt. Starting with the end of this past quarter, Engility will have to pay $12.6 million toward principal each quarter. With only $80 million in cash flow from operations (at the low end), it doesn't leave a lot of room for error after taking into account their principal and interest payments. Luckily the government services business doesn't require much in terms of capital expenditures (~$5 million in 2013), a service business with their employees usually working onsite or close to their clients, very capital efficient. I also tend to side with the camp that believes some debt can be beneficial to a business as it ties management's hands and keeps them from making poor capital allocation decisions; the next several years are pretty much set at Engility, free cash flow will be used to pay down debt. And with Engility facing no major contracts remaining for recompete in 2013, the initial concerns over revenue declines might be overblown? Not to get political (but hard in the government services business), will the government actually follow through and cut spending drastically? With the overall economy improving and the deficit shrinking, budget issues might get kicked down the road a little longer. Seems like the politically easiest answer. The defense industry is often called the biggest government jobs program for a reason. Plus with tensions around the world seemingly always escalated these days, never know when the next conflict could erupt. The low expectations seem pretty priced in at this point. With spinoffs, you always have to pay attention to how the incentives are aligned. With Howard Hughes, management literally dipped into their personal savings to buy long dated warrants before taking the job. Engility seems to have the more typical options and RSUs structure, not necessarily a negative, but not a screaming positive like if they bought equity out of pocket. But I do like Engility's ownership profile, several hedge funds with concentrated positions, plus I always like to see Pzena Investment Management (PZN) up there as they're another one of my favorite value investors. I'm pretty much fully invested at this point, I tend to think the individual investor managing their own account should be able to find enough names to fill out a portfolio in any environment, even a potentially fully valued one. But I'm adding Engility to my shopping list and will likely start a position if we get another self created budget deadline in Washington that causes more uncertainty in the defense and government services sector. A similar spinoff that also interests me is Exelis (XLS), which has been described as a pension fund with a defense business attached. It probably deserves its own post, but with interest rates, and as a result discount rates so low, pension fund liabilities are likely overstated, could be an interesting place to look for value in a rising rate environment. Will Comdisco Ever Finish Liquidating? I was sifting through Horizon Kinetics' holdings (one of my favorite value investors) and stumbled upon an interesting special situation in Comdisco Holding Company (OTC:CDCO). 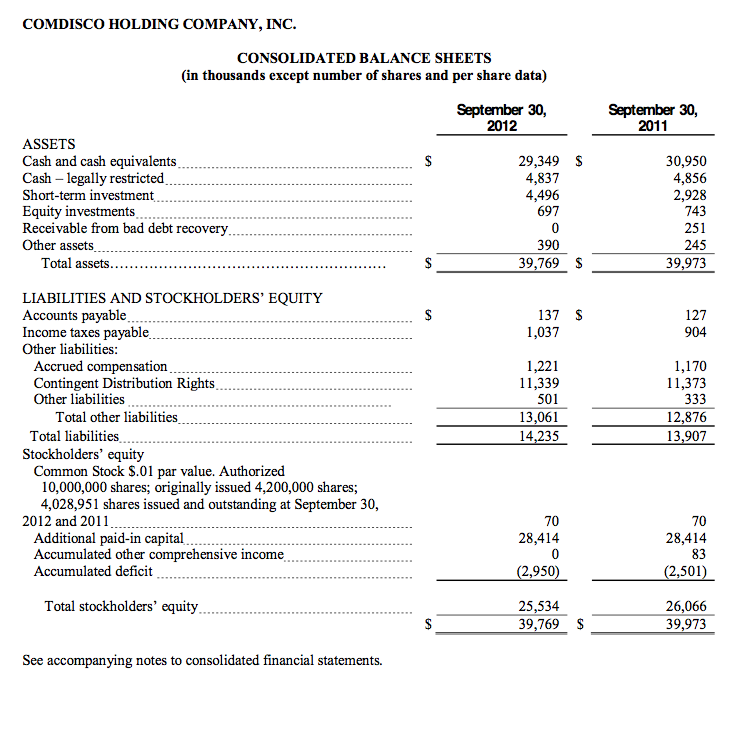 Comdisco was a computer leasing and disaster recovery company that ran into trouble in the aftermath of the dot.com crash and declared bankruptcy in 2001. Prior to their troubles, CEO Nicholas Pontikes used $3 billion to invest in 900 starts ups in the middle of the tech bubble, a rather disastrous decision. After declaring bankruptcy and emerging as Comdisco Holding Company, the new entity's limited purpose was to sell the company's assets (including the 900 start ups) and distribute cash to the creditors and shareholders. It's essentially a zero coupon bond, but without a defined maturity date. Today, with only a few of the start up investments remaining and most of the assets in cash or near cash, the liquidation scenario is pretty easy to estimate with the current balance sheet. The one adjustment I'll make is to value the company's equity investments in private companies at $5,166,000 per Comdisco's estimate of the realizable value. With that adjustment, stockholders' equity jumps to $30,003,000 versus a current market capitalization of $20,190,000. The question becomes, how long will it take to complete the liquidation? A quick Google search will show investors asking this question in 2008-2009 and assuming it would be only 2 years, and here we sit in 2013. Now that most of the private company investments have been sold off, could it finally finish in the desired 2 years? As a general rule, I look for investments that return a 20% IRR, plugging the PV, FV, and I/Y values into my trusty BA II Plus and I get 2.17 years, so probably anything under 2 years gets you over the 20% hurdle when you consider ongoing expenses, etc. One other thing to consider, the contingent distribution rights holders seem to be telling us that an end might in sight. 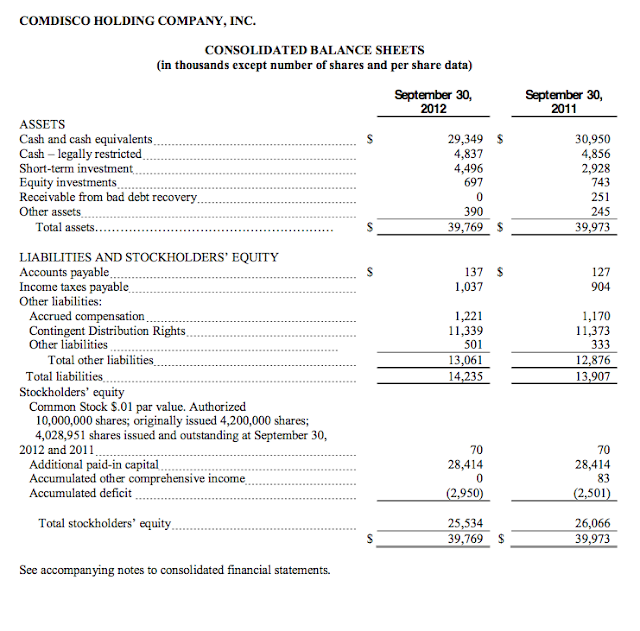 CDCOR shares last traded for $0.069, with 148,448,188 shares outstanding, that's a market capitalization of $10,242,925 compared to the $11,229,000 liability on the balance sheet, only about a 10% discount. Overall, Comdisco seems like an interesting special situation without much downside and little correlation to the broader market. But beware, its highly illiquid and rarely trades, probably going to have to be patient with a GTC limit order. Gramercy Property Trust (GPT) reported its first quarter minus the CDO management business which caused all the consolidation problems with their balance sheet. Everything looks pretty much as expected, just progressing with the already outlined plan. I continue to be impressed by the level of disclosure Gordon DuGan and team give on a quarterly basis, if only every management team provided the level of detail on their business. On the conference call today, management spent a lot of time laying out the case for how net leased REITs are trading at "very attractive valuations", and by that they mean for the sellers of equity (which they'll be after their acquisition capacity is used up) and not for the buyers. 1.2-1.3x NAV, 21x AFFO, 2.8x book, anyone buying into the sector at this point should be expecting much lower returns going forward. 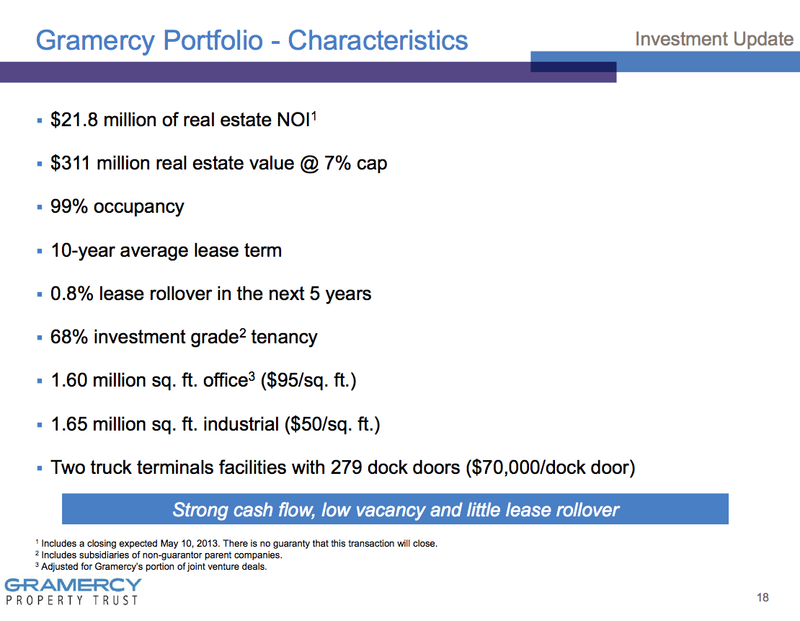 At the end of my post on how REITs are overvalued, I mentioned the arbitrage opportunity that Gramercy is being presented with as a new net leased REIT flush with cash. They could purchase commercial real estate assets in the private market and have the public REIT market almost instantly value (well probably more so after the dividend is reinstated) those same assets at a higher valuation. 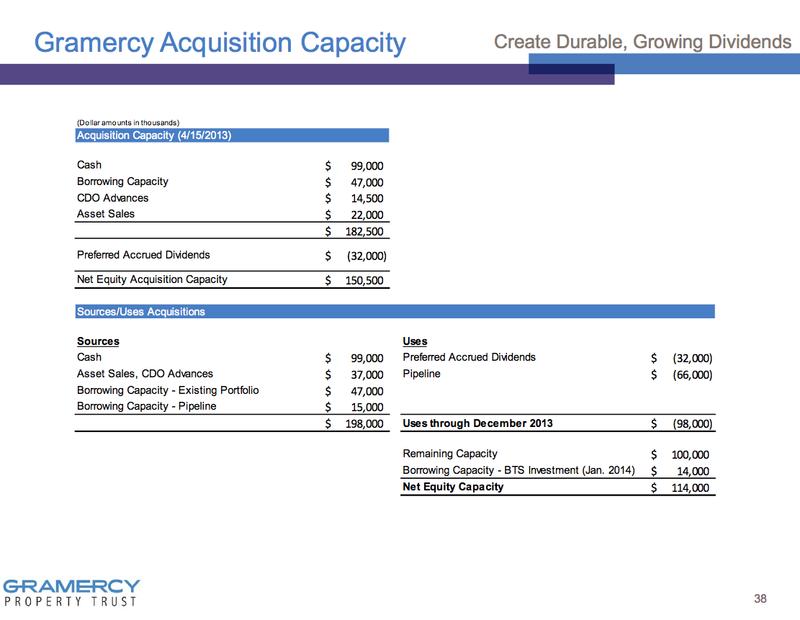 I was pleased that Gramercy pointed this exact setup out on page 31 of the their updated business plan presentation. I just hope they can balance making good asset acquisitions with the need to capitalize on the market and trade inline with peers before the cracks appear. With that macro backdrop, I want to update my valuation of Gramercy after the acquisition capacity (page 38 of the presentation) is used up. 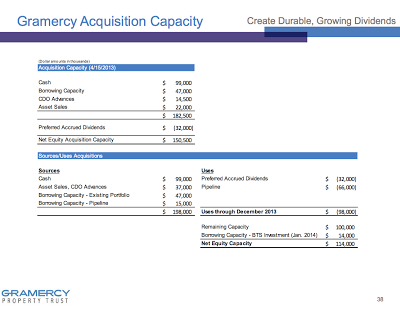 In this slide Gramercy lays out the available cash (including the potential borrowing capacity) and subtracts out the preferred (hints that its coming this year?) and the deals already in the pipeline. In the first quarter the cash was mostly left untouched as Gramercy used the sale proceeds from the CDO bond sales to purchase several truck terminals and industrial properties. The current portfolio is expected to have $21.8 million net operating income (roughly the same as projected before). If the acquisition capacity dry powder is exhausted at a 7.5% cap rate (mid-point of the arbitrage slide above) and using 55% leverage on the $150.5 million produces another $25.1 million in NOI, for a total real estate NOI of $46.9 million. I'll keep using the $10 million net income number for the asset management group as it sounds like Gramercy is in the money on the incentive/performance fees and are planning on broadening the client base beyond the KBS portfolio and the Bank of America JV, total combined NOI is now $56.9 million. Using a 7% cap rate, the real estate value would be $670 million and the total debt would be projected at $368 million. So on the expense side: a 4% interest rate on $368 million equals $14.75 million annually in interest expense, core MG&A is $13.0 million, and the preferred dividend is $7.16 annually, total expenses of $34.9 million. AFFO = $22 million or $0.37 per share, basically what I came up with last quarter, using the same 14x AFFO and I come up with a valuation of $5.19 per share. 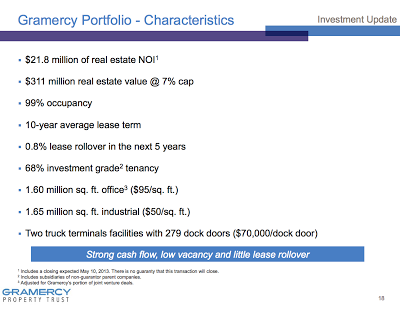 Using Gramercy's analysis of the top comps in the net leased space at 21x(!) AFFO and you get a valuation of $7.77 per share. I tend to think the 14x multiple is more appropriate given that Gramercy is maybe 40-50% of the way through their initial cash position since Gordon and team took over. Management also discussed on the call how intense the competition is for net leased assets (they're trying to stay out of the fray with smaller industrial purchases), so the valuation gap between the private and public markets could narrow reducing the eventual price target. Like many GKK investors, I bought in due to the cash balance and CDO assets, never quite imagining the company looking like it does today, but really couldn't be happier with the direction of the company. I plan on holding until Gramercy depletes its acquisition capacity, becomes current on the dividends, and the yield hungry investors bid up the shares. Instead of posting a whole series of short posts on the recent results of companies I've discussed on the blog, I thought I'd start summarizing and grouping my thoughts together. AIG posted first quarter results that the market absolutely loved, driving the stock price up considerably for a mega-cap name. The big headline is AIG's combined ratio dropped below 100 for the quarter, meaning they're making an underwriting profit and not just relying on investment returns to drive profitability, which often leads to riskier investments. This is significant because since 2005, AIG's P&C business has produced positive underwriting income in only two years (insurance expense has exceed premiums by about 4%). AIG's Life and Retirement business also posted improved results, mainly as a result of the stock market performance in the first quarter driving up assets. The improved housing market has also lifted their United Guaranty Corporation business, but with it being such a small piece of AIG, does it make sense to sell this unit or spin it off given the recent love for names like Radian? I'm probably not smart enough to answer that question. AIG's thesis is still intact, ROE is inching towards 10% and the book value is about $60 per share, the market price should keep grinding higher closer to book with the help of their debt reduction, stock repurchases, and the initiation of a dividend. CEO Bob Benmosche appeared yesterday on CNBC to discuss their results, a few awkward Mario Rubio like water bottle moments aside it was a good interview. Tropicana posted relatively weak first quarter results citing continued negative impact from Hurricane Sandy at the Atlantic City property, company wide revenue was down over 8% compared to the same quarter in 2012, but net income was up as a result of their debt refinancing. We know that gambling spending is down nationwide, but when will Hurricane Sandy no longer be a valid excuse and its instead its really just Atlantic City in terminal decline? Tropicana also disclosed that in January they settled real estate tax appeals with Atlantic City. Tropicana will receive $49.5 million in the form of future tax credits ending in 2017, a pretty significant number given AC revenues that should drop straight to the bottom line (the $49.5 million is front weighted towards 2013/2014). Tropicana also announced an agreement to sell the River Palms hotel and casino for $7.0 million, with the closing happening in the third quarter. $7.0 million sounds cheap to me for a 58,000 square foot casino, a hotel, and 35 acres of land, but Tropicana has been hinting at problems with the Laughlin market in the past and in particular with the River Palms operation, so it shouldn't have been a big surprise. Overall, the thesis here hasn't changed, Tropicana's true value is being hidden by its low float and net cash position which should be used to either acquire or build new casinos. Icahn Enterprises (IEP) has begun providing an Indicative Net Asset Value Calculation on their quarterly press releases; IEP raised its valuation metric from 8x EBITDA to 9x EBITDA, valuing its 67.9% stake at $551 million, making the entire company worth $811 million, or roughly $30 per share versus the $15.75 its trading at today. But given its lack of liquidity, not a name for everyone. No real surprises with Ultra Petroleum's results either, production dropped as they reduced capex throughout 2012 while waiting for gas prices to respond to a more normalized supply/demand environment, which is finally happening with prices now above $4. The increase in gas prices have brought the PV-10 value of their reserves back up to $5.25 billion, but due to accounting rules, Ultra won't be able to reverse the write-downs on their balance sheet, but the assets are still there and quite valuable due to Ultra's low operating costs (cash flow margin @ 55%, net income margin @ 26%). On the conference call there was more talk this quarter of looking to acquire an asset that would be a "third leg of the stool" to their Pinedale and Marcellus assets. Ultra would use their free cash flow from 2013 and 2014, plus some additional debt to make the purchase, and they'd be agnostic to the commodity involved. I'm a little torn on an acquisition, I think the market would like Ultra to make a more liquid rich purchase, but my thesis is based on Ultra being a pure play on natural gas and natural gas prices reverting to the mean. Additionally, if Ultra's Pinedale field returns 40-60% IRR at $4 gas prices, why not focus on this property and return cash to shareholders by paying down debt? Management has said they are a return focused, not a growth for growth's sake company, so hopefully any acquisition would have a high hurdle rate. As the market continues to make new highs it's getting more and more difficult to find value in mainstream equity securities. Most potential investments that interest me have a bit of hair on them, one that has recently appeared on my radar is Calamos Asset Management (NASDAQ:CLMS, but I'll refer to it as CAM). I should probably wait another week for their 1st quarter results to come out, but I haven't posted in a little while and wanted to get something out here. John Calamos started what would become Calamos Asset Management in 1977 by taking out a home equity line of credit and focusing on convertible bonds. Today Calamos is a vanilla multi-strategy asset manager with $30.6 billion in assets (as of 12/31/12) based out of Naperville, Illinois, a western suburb of Chicago. After graduating college in the early 2000s, I actually interviewed for a position at Calamos and subsequently didn't get hired, probably ended up being a smart move on their part, no hard feelings. Calamos was a darling of the late 1990s and early 2000s posting some stellar returns. Management took advantage and went public in 2004, they had a couple of good years and peaked with the market in 2007, since then they've struggled with mediocre to poor performance in their flagship Calamos Growth Fund and the Calamos Growth and Income Fund. Both have seen significant drops in assets due to both losses in the portfolios and investor outflows. In 2007, Calamos Growth Fund had over $15 billion in assets, today it has $5.2 billion and has badly trailed the S&P 500 over the past 2 years (+9.33% vs +16.00% in 2012, -9.07% vs +2.11% in 2011) and continues that trend in 2013. On the bright side to the poor performance of their growth fund, Calamos has been forced to diversify their business model and focus on a variety of strategies potentially making their go-forward revenue streams less sensitive to the fortunes of one portfolio. And despite all the recent struggles, Calamos' operating margins have remained pretty steady in the 35-40% range, showing their ability to right size expenses as assets have come down since 2007 (also might shoot holes in the potential argument that if assets increase, Calamos would have a lot of operating leverage). In addition to their poor performance, Calamos has a complicated corporate structure that obscures the true underlying value. 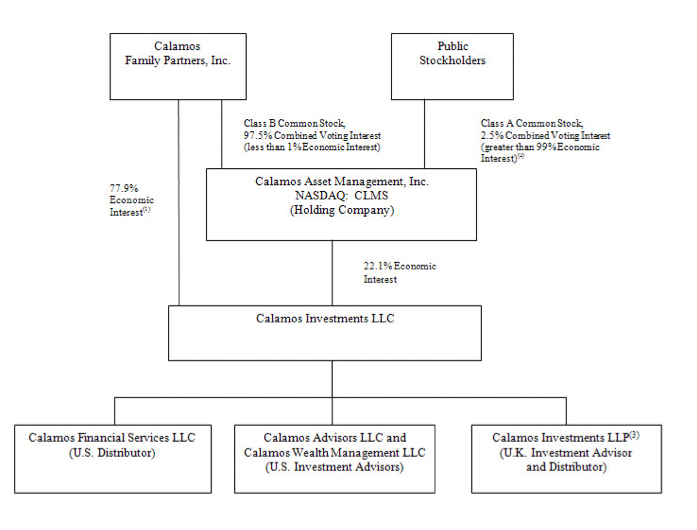 The public stockholders have a 22.1% economic interest in Calamos Investments LLC, a partnership where the operations take place, and the remaining 77.9% is owned John Calamos and his family through Calamos Family Partners, Inc. Additionally, Calamos Family Partners owns all the Class B Common Stock of Calamos Asset Management giving them 97.5% of the voting power, the family is fully in control of their namesake company. Below is the graphic provided in the 10-K. Sorry if that's a bit hard to read, but to summarize, CAM shareholders have a sole interest in $67.6 million in cash and tax receivables, plus a net deferred tax asset of $55.3 million, discounting the DTA and the combine total is worth $105.4 million or $5.17 per share to CAM. That's 46% of the current price of $11.20 per share, so it begs the question what's the 22.1% of Calamos Investments worth? In 2012, the pre-tax operating earnings of Calamos Investments was $119.8 million (or roughly 1% of assets under management, in line with their historical results). Most asset management firms trade for something close to 10x pre-tax earnings, but given the recent performance struggles and odd corporate structure, let's give them a discount of 8x pre-tax earnings. At 8x $119.8 million, the fee income stream is worth $958 million to Calamos Investments, or $211.7 million to CAM, $10.39 per share. Add up the three pieces, and CAM's fair value should be close to $19.43 per share compared to today's price of $11.20. Another way to look at it, the market is only valuing the $26.47 million pre-tax annual CAM revenue stream at $44.03 million. Or on an after tax basis, the market is giving the fee business a 2.5 P/E (($11.20-$3.87-$5.17)/($0.88 diluted EPS)). Calamos also pays a $0.125 quarterly dividend (roughly ~4.5% annualized) to shareholders while you wait for the valuation gap to close. The dissenting view on Calamos would ask why the valuation gap would ever close? Calamos Family Partners is getting its pro-rata share of the taxable income from Calamos Investments and at this point the family doesn't appear to have a pressing need for CAM's valuation to catch up to intrinsic value. However, I'm a believer that value can be its own catalyst and CAM is clearly undervalued. Any signs of the "great rotation" into stocks by retail investors coming true could also improve investor sentiment around traditional asset management firms.